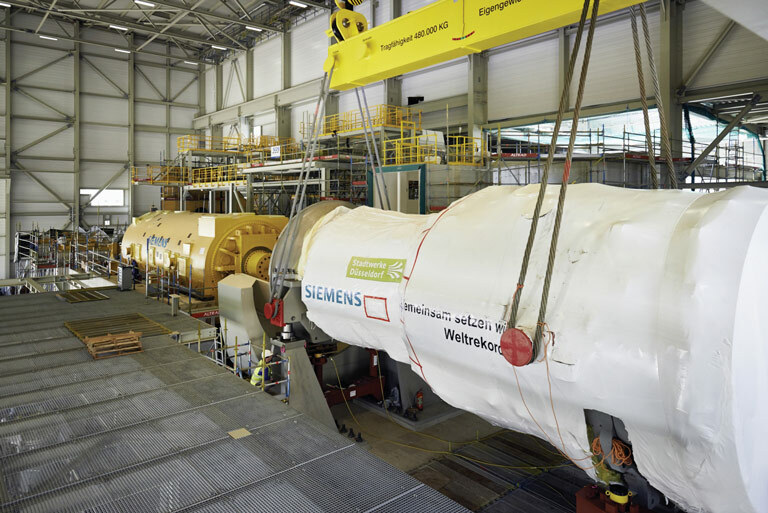 Since commissioning of Unit 4 at the Irsching Power Plant, Siemens has sold nearly 80 other H-class turbines. Including the new Fortuna unit in Düsseldorf, 19 H-class turbines are now in commercial operation worldwide. Additionally, combined cycle gas turbine (CCGT) plants are increasingly in demand, particularly as global gas supplies increase. 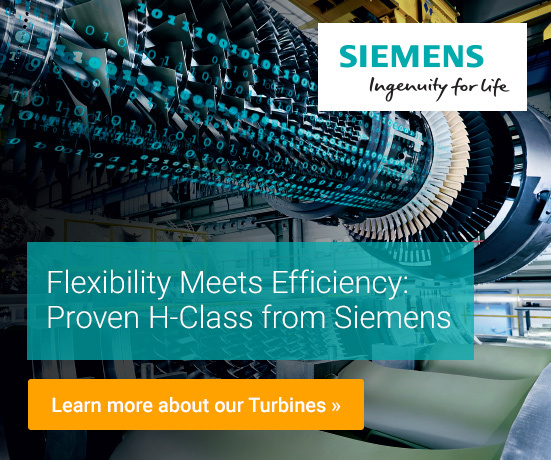 According to Siemens, combined, the company’s H-class turbines have delivered over 230,000 equivalent hours of operation as of June 2016, fleet reliability is over 99%, and availability tops 96%. However, as this story goes to press, two of Fortuna’s records have already been broken. In mid-June, General Electric, which recently purchased Alstom, announced in combination with French energy provider EDF that it had set a new efficiency record of up to 62.22% at the Bouchain, France, combined cycle power plant. GE’s high-performance HA turbine was able to generate 605 MW, also surpassing Fortuna’s capacity. The Bouchain plant is also designed for quick starts and stops so it can ramp up as renewables slow down. Ramp times however, are a little slower than at Fortuna. Bouchain requires an additional 5 minutes to fully power up. The technology vendor battles continue as GE has pledged to surpass the 65% efficiency mark in coming years as generators increasingly look to CCGT plants to replace coal, reduce emissions, and ensure grid stability. The SST 5000 series consists of a combined high-pressure/intermediate-pressure (HI) turbine, and a low-pressure (LP) turbine. Preassembled modules reduce coordination effort, on-site assembly time, and technical risk.. The SGen-3000W series features generators with water-cooled stator windings and hydrogen-cooled rotors. They are the optimal solution for the highest output ranges up to 1,300 MVA and feature a compact design. They are particularly well suited for large steam power plants. The higher, optimized performance of the SGen-3000W series can be traced to the unique combination of the specific heat properties of water for cooling the stator winding and the more efficient hydrogen-cooling of the rotor winding. SGen-3000W series generators normally achieve the same or higher efficiency levels than air-cooled models with the equivalent rating. 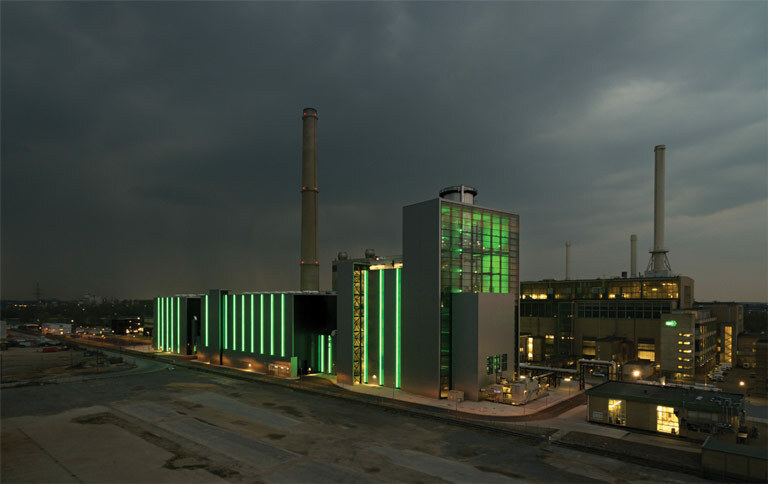 Düsseldorf’s new “Block Fortuna” at the Lausward Power Plant, owned by municipal utility Stadtwerke Düsseldorf, is setting records and giving Germany’s coal-fired power plants some much-needed competition for backing up the nation’s large percentage of variable renewable power. Germany’s Energiewende (literally, “energy turn”) functions as something of a living laboratory, where innovation equals survival, because traditional market forces—and policy goals—have been turned on their heads. Though the goal of Germany’s “energy turnaround” is to reduce carbon dioxide (CO2) emissions while gradually phasing out nuclear and coal plants in favor of more renewables, the results have been a mixed bag. Even though, on most days, Germany produces a third or more of its 60-plus gigawatts of power from intermittent renewables, recently, CO2 emissions have actually been increasing. That’s because, as nuclear plants are slowly being phased out, Germany is relying more and more on cheap coal. Though natural gas burns cleaner, it’s the most expensive fuel option and, given Germany’s “merit order,” even the most efficient gas-fired plants are the last ones to be powered up on a high-demand day. But as coal and nuclear plants are shut down over the coming decades, gas-fired plants may eventually become both the backup and baseload solution of the future. However, as of 2015, only 9.1% of the nation’s electricity came from natural gas, according to the country’s bureau of statistics. Far in the lead was coal, which generated 41.9% of Germany’s total gross electricity. 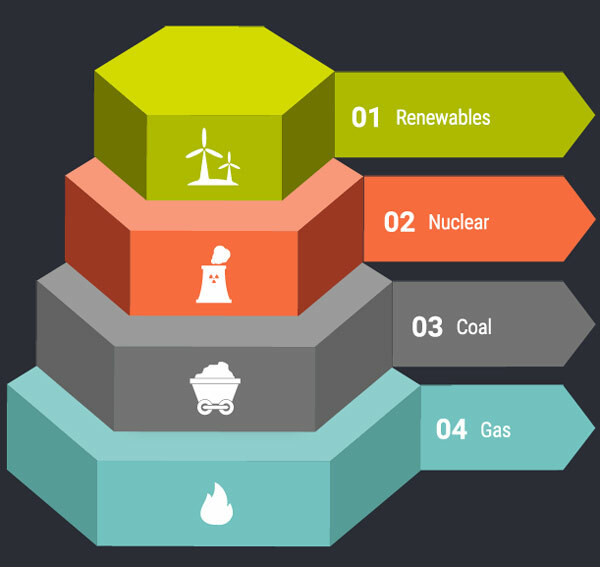 Renewable energy sources delivered 30.1% over the year, nuclear power was down to only 14.1%, while mineral oil products and “other energy sources” accounted for the remaining roughly 5%. Ironically, even as Germany has embarked on its Energiewende, in recent years several new coal-fired power plants have come online that are designed to quickly ramp up and down, thus ensuring grid stability and reliability in the face of renewable intermittency. To help compete economically with these plants while ensuring lower CO2 emissions, engineers at Siemens AG have been developing ever-more-efficient natural gas–fired turbines that can also ramp up and down quickly as demand spikes while significantly reducing fuel usage and emissions. 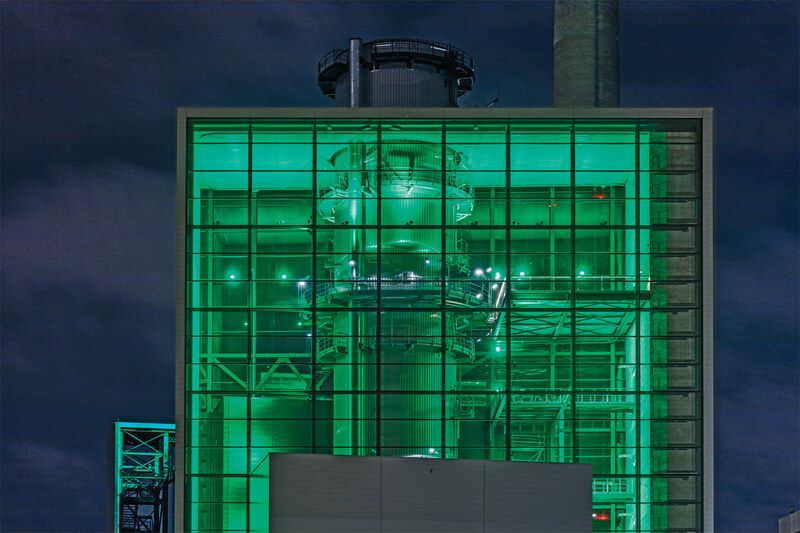 On January 25 this year, the gas-fired Fortuna unit of the Lausward Power Plant, owned by the municipal utility Stadtwerke Düsseldorf, began commercial operations—almost immediately setting several world records for power generation capacity and efficiency. For setting a new standard for a high-performance combined cycle gas turbine (CCGT) plant that also supplies district heating, the Fortuna plant has earned POWER’s Plant of the Year award. Combined cycle gas turbine power plant generation efficiency record of 61.5% when commissioned. Electrical output record of 603.8 MW in single-shaft combined cycle operation. Highest thermal energy, 300 MW, extracted for district heating anywhere in the world from a single unit. Visually attractive industrial facility façade to integrate with urban setting. As the turnkey provider, Siemens manufactured and provided all of Fortuna’s major components, including its gas turbine, steam turbine, generator, and heat recovery steam generator (HRSG). The company also installed its SPPA-T3000 instrumentation and control system, the plant’s main transformers, and will perform plant maintenance services. Including long-term maintenance for its equipment, the Siemens contract was reportedly valued at about $562 million. Several subcontractors constructed the steel work and façade of the facility and contributed other components and materials. Vallourec S.A. provided 1,000 tons of premium-grade corrosion-resistant boiler tubes. AkzoNobel Global supplied several thousand liters of high-performance coatings from its International range for the plant’s structural steel and pipework. Norway’s Statoil is supplying the natural gas. Designed by the architectural firm kadawittfeldarchitektur, the building complex enhances the cityscape by communicating the pioneering nature of the facility. Fortuna’s silver-colored steel façade has also been creatively optimized. The reflective outer shell features hundreds of recessed LED lights that turn the building into something of an illuminated work of art at night (Figure 1). But one of the most unusual design elements is the 65-meter-high “city window” (shown in this issue’s cover photo during the day and in Figure 2 at night). Glazed on both sides, it forms the northeastern end of the plant and includes an observation deck that’s 45 meters above street level. 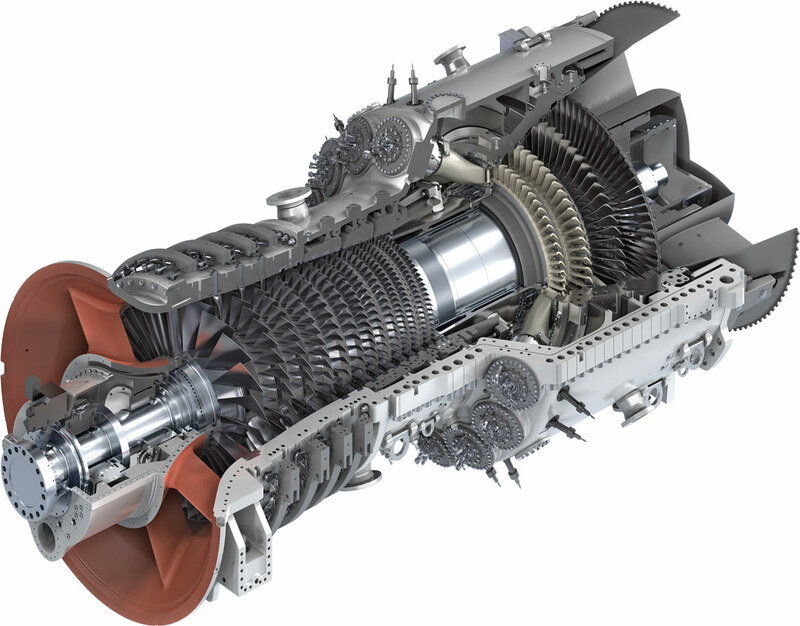 We power the world with innovative gas turbines. The Siemens gas turbine range has been designed and tailored to help meet our customers‘ challenges in a dynamic market environment. Fortuna was completed 18 days ahead of schedule, on budget, after more than 2 million worker hours of construction. Not a single lost-time accident occurred throughout the erection phase (see table). The Latin word “fortuna” means “luck” or “destiny,” and when officially commissioned on May 22 this year, Fortuna represented both the current technological apex of gas turbine development and pointed the way forward for how natural gas–powered plants can compete with and eventually potentially replace coal in Germany and in other locations around the world while continuing to drive down CO2 emissions (see sidebar “Never-ending Competition for Greater Efficiency”). Düsseldorf’s development strategy was to economically meet its ambitious climate goals of achieving carbon neutrality by the year 2050, which for this city in western Germany means reducing CO2 emissions to just 2 tons per capita. 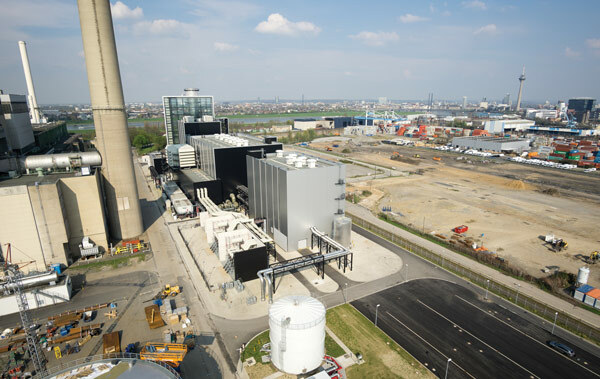 Located adjacent to the Rhine River near the city’s harbor, Fortuna’s new CCGT and cogeneration system uses the heat generated by its turbines three times: twice to make steam to generate electricity and once to provide district heating for an increasing percentage of Düsseldorf’s 600,000 residents. 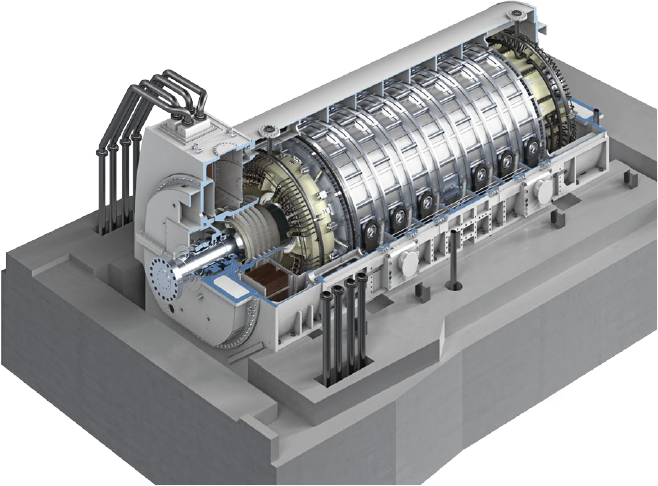 The centerpiece of Fortuna is a single Siemens Model SGT5-8000H gas turbine, manufactured in Berlin (Figure 3). 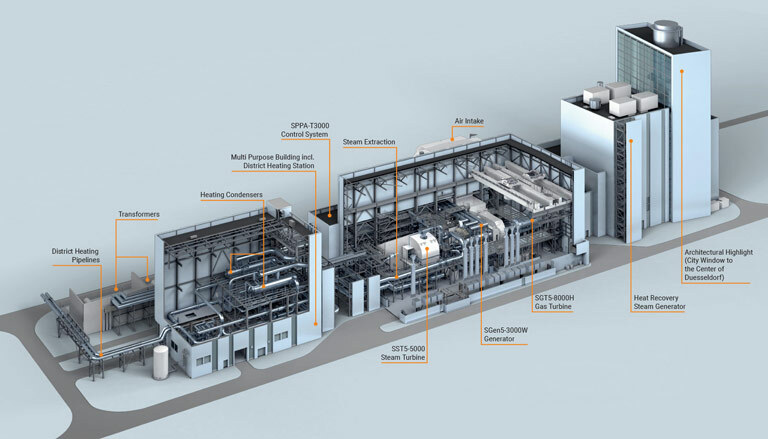 Together with the downstream steam turbine of Siemens SST5-5000 series, operating in combined cycle, the unit has a capacity of 603.8 MW—a world record for a single-shaft CCGT when the plant was commissioned. 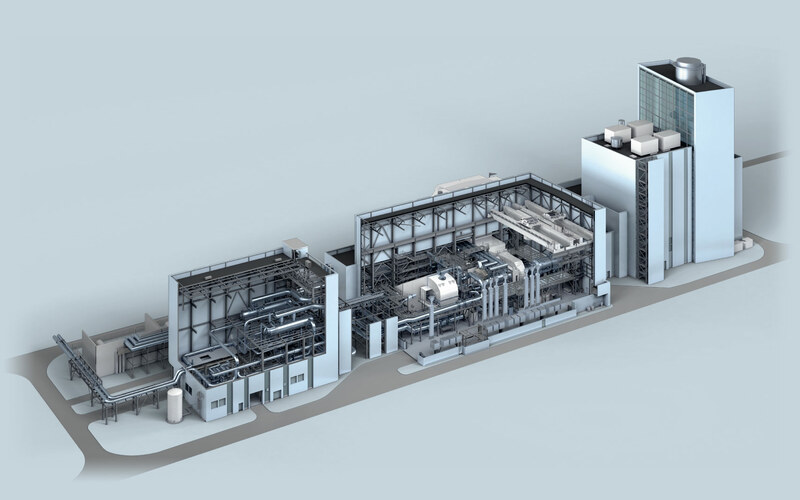 The gas turbine can run at full load in less than 25 minutes after a hot start, enabling it to ramp quickly, ensure grid stability, and take advantage of any opportunity to generate both electricity and income. “We selected fully air-cooled technology for our engines,” said Willibald Fischer, Siemens’ director for gas turbine product management, at an April press event at Fortuna attended by this POWER freelancer. “We derive 400 MW from the turbine, which is about two-thirds of the power of the plant. The other one-third is from the steam turbine. This is a total one to one at roughly 600 MW. The overall efficiency increases from 40% to over 60%,” Fischer said. The triple-pressure Benson HRSG that heats steam to over 600C at 170 bar clearly supports Fortuna’s high electrical efficiency. Fortuna’s 61.5% electrical efficiency exceeds the previous world record (also set by Siemens) of 60.75%, set by the Ulrich Hartmann combined cycle Unit 4 at Irsching Power Station in southern Germany—a 2011 POWER gas-fired Top Plant Award winner. Fortuna’s high electrical efficiency, combined with its efficient use of “waste” heat generated in the power production process for district heating—when the plant operates in combined heat and power (CHP) or cogeneration mode—increases overall efficiency of the plant to around 85% and reduces CO2 emissions to 230 grams (g)/kWh. By way of comparison, Germany’s entire generating fleet (including renewables) produced average emissions of 609g/kWh in 2014. Although world records are significant, they can’t guarantee that a plant will operate or make any money. For decades, the decision about which power systems to run in Germany has been determined by fuel costs. The nation’s “merit order” system favors renewable energy first, meaning that at all times, whatever “green” power can be generated, is generated. Germany’s demand is generally about 60 GW, and the government hopes renewables will regularly fulfill about 80% of that demand by mid-century. In theory, Germany can produce 80 GW from renewables already, but those sunny, windy days are rare and do not provide consistent energy. However, 40-GW peaks are becoming much more common. 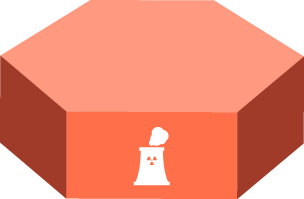 Next in the merit order are Germany’s nuclear plants, which are slowly being phased out over the next decade. Nuclear’s current 20 GW of capacity is on track to eventually be reduced to zero. As the nuclear units are retired, increasingly, lignite coal plants are taking over their market share. Locally sourced lignite is both cheap and plentiful, though extremely dirty in terms of emissions. With huge reserves throughout the nation, it can be purchased for as little as $10 per ton when mined from vast surface operations. Ironically, from Fortuna’s high “city window” perch, you can easily observe nearly a dozen coal units on the horizon. Next up are the nation’s hard coal plants—though only one deep German coal mine is still operating and is slated for shutdown next year. But imported coal, with a much higher energy value than lignite, is still quite cheap comparatively—roughly $50 a ton—and with today’s depressed market, quite plentiful. So in Germany’s merit order, CCGT units are generally pushed into the role of only providing peak-load coverage. Gas plants without cogen capacity have to accumulate some 4,000 hours of operation per year before investment will pay off. In this scenario, only the most nimble gas-fired plants have a chance to step in and support solar and wind generation. “That was something we perceived already in 2000. And we developed on that path with the SGT5-8000H model gas turbine,” said Fischer. 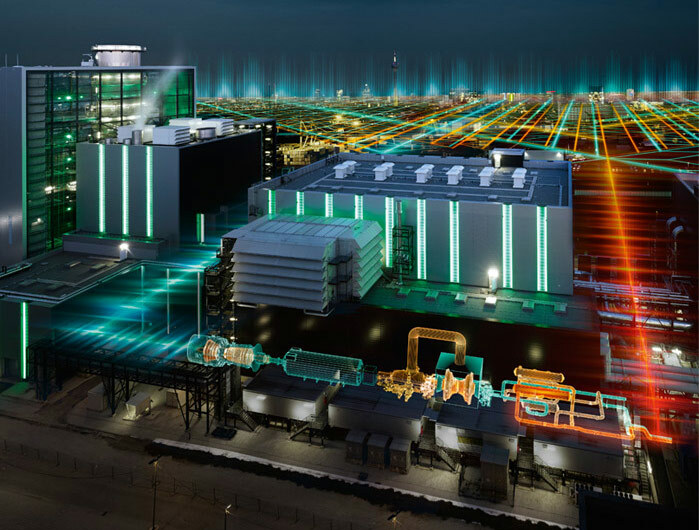 Either way, according to Siemens, modern plants fitted with the company’s F- or H-class gas turbines are adapting technically to these new requirements. 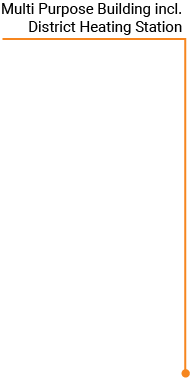 “Startup times of under one-half hour are achievable without increasing component wear. These power plants are perfectly suited as backup units for the fluctuating grid feed of weather-dependent renewable energy sources, precisely compensating for shortfalls when needed,” said Lothar Balling, Siemens’ executive vice president for global project management at the Fortuna media event. When the city of Düsseldorf approached Siemens about its desire for a new baseload but flexible gas-fired plant to replace a coal-fired one at the site, city leaders worried that if they chose a combined cycle plant, they could inadvertently be commissioning another potential white elephant like Irsching Unit 4—which, since 2011, had been powered by a Siemens gas turbine nearly identical to what was proposed for Fortuna. Irsching’s unit, formerly the most efficient power plant in the world, is currently operating a mere 400 hours (16.66 days) per year and is losing money for its operator, E.ON subsidiary Uniper. Düsseldorf did not want to go down the same path. To ensure its economic viability, Fortuna—unlike Irsching—is also used for district heating. The temperature at the turbine’s front blades is 1,500C, and its waste heat is extracted by a downstream heat exchanger to power a steam turbine and generate additional electricity. The steam turbine is located along the same axis as the gas turbine and the generator. Steam from the turbine is channeled through three thick pipes to heat exchangers in an adjacent building. From there, hot water at more than 95C flows through an insulated pipe underneath the Rhine to the city center (Figure 4). The strategy is that when Fortuna is priced out of the generation markets, it can operate in a heat-optimized mode to provide district heating. To maximize this potential, Düsseldorf is constructing a 40-meter-high tank adjacent to the power plant to hold 35,000 m3 of water. Beginning next winter, the tank will be able to store hot water for several days, enabling the power company to freely decide which mix of electricity and heat the Fortuna unit should supply. However, with climate change advancing, Germany’s winters are getting progressively warmer, and Fortuna depends on its district heating duties to stay profitable. But, according to the city, “on account of the mild winter,” the heating portion of this CHP plant has not yet been fully utilized. “Though the full district heating extraction is about 300 MWth, we have only achieved about 280 MWth,” said Nathalie Güttler, Stadtwerke Düsseldorf’s media coordinator in an email to POWER. Though the flexibility is there to run the plant at low or high loads with more steam extraction, the fully rated electrical output of 603 MW can only be achieved without steam extraction. 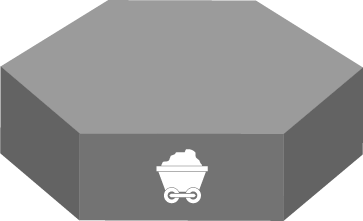 “If you use the heat, it goes down to 520 MW at maximum extraction. We are extracting the steam out of those three lines, which allows us to tap into the turbine. However, with this option, we get 40% more utilization of Fortuna compared to plants without this option. This is a specific advantage for the city,” said Balling. Germany’s government would like to see about one-quarter of net controllable power generation coupled with heat production by 2020. The recently amended Combined Heat and Power Act of 2016 now subsidizes cogeneration plants with outputs exceeding 2 MW. For these reasons, planners hope to increase sales of district heat by 15 MW per year. Quick, cold startups help keep Fortuna economic, but quick hot stops make it cleaner. Fortuna’s potential profitability is also enhanced by the fact that its 445-ton gas turbine only takes 25 minutes to ramp from no generation to maximum output and can be shut down again just as quickly. The power plant is also capable of accommodating load changes of 55 MW per minute between minimum and maximum load. 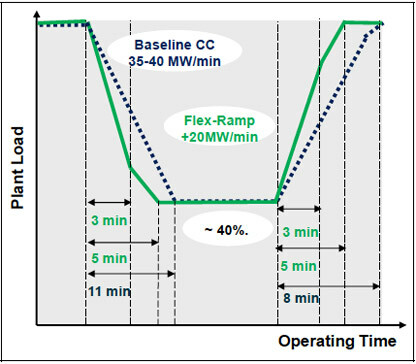 That ability is supported by Siemens’ new “Flex-Ramp” technology, which enables the plant to ramp up and down at 55 MW/minute. 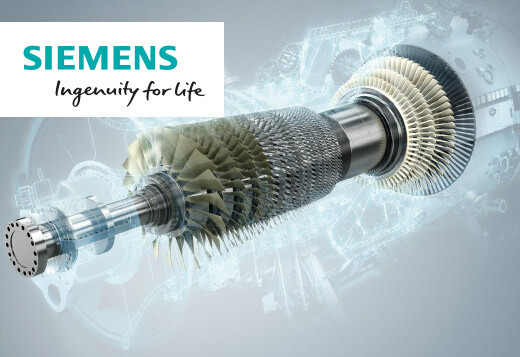 “If an increase in output is desired, in parallel and simultaneously with running up the gas turbine as quickly as possible, the steam turbine’s output is increased markedly higher than is conventionally possible in traditional combined-cycle power plants,” wrote Siemens engineers. Initial power feed to compensate for grid fluctuations is also available within 5 minutes after startup when the gas turbine synchronizes with the grid. Siemens supplied its “Co-Start” technology to significantly increase the entire plant’s flexibility. 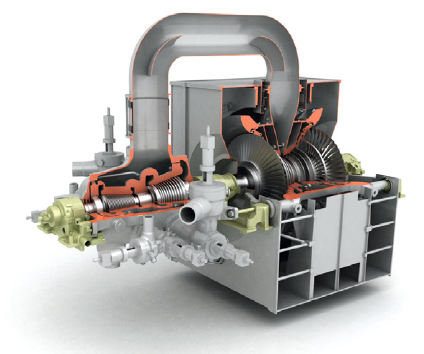 Instead of starting the conventional way, as at Irsching and other similar units, Fortuna’s steam turbine starts up along with the gas turbine. It also increases its output at the highest rate possible until it reaches full load. As the gas turbine starts and ramps up, it increases its output at the steepest possible gradient right up to full load, without waiting for staggered startup of the steam turbine, as is customary. Waiting periods and “hold-points” are thus rendered a thing of the past. 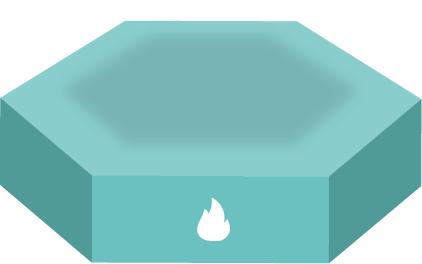 The new hot-start procedure combined with this Co-Start solution is governed by improved instrumentation and controls. “We consequentially reduce fuel costs during the startup phase and increase plant responsiveness to rapidly changing market conditions, enabling plant operators to start units rapidly and precisely at that point in time when favorable market conditions are effective,” said Wilson. Warm start times—typically, a unit restart after a weekend shutdown lasting up to 48 hours—have also been decreased by using the Co-Start technology. 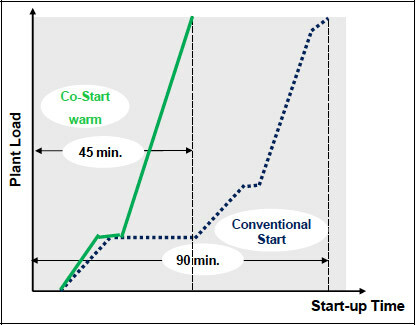 “The improved startup procedure is basically achieved by implementing the same technical measures and modifications of the startup process as for hot starts, the only difference being the different temperature and pressure conditions in the heat recovery steam generator considered by the instrumentation and control system after the longer period of shutdown,” explains Siemens in a whitepaper describing Fortuna. According to the company, if electricity needs are low, the facility can reduce output to 35%. At many other power plants, such a reduction would cause emissions of carbon monoxide and other pollutants to rise sharply. But at Fortuna, Siemens engineers developed a new system called “Clean-Range” that keeps emissions below statutory limits even when the plant is running at low loads. According to Siemens, during test runs performed at Fortuna, its engineers determined the company’s new Quick-Stop technology enabled them to shorten the normal shutdown time to 25 minutes—cutting the standard time of 45 minutes by almost half, thus increasing fuel savings and lowering emissions. From start to stop, the new Fortuna plant is well-suited for an increasingly challenging power market. POWER’s editorial team recognizes the city of Düsseldorf and its utility, Stadtwerke Düsseldorf, for their commitment to developing the most efficient, environmentally friendly, and flexible fossil-fueled plant possible. Congratulations on winning POWER’s 2016 Plant of the Year Award! May the Fortuna plant continue to enjoy good luck. Lee Buchsbaum (www.lmbphotography.com), a former editor and contributor to Coal Age, Mining, and EnergyBiz, has covered coal and other industrial subjects for nearly 20 years and is a seasoned industrial photographer.